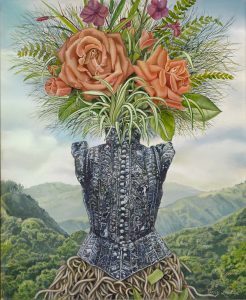 Amy Laskin is a Jamaican based artist. 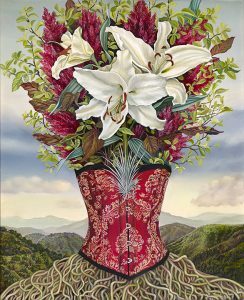 She gives life to spectacular paintings in which she mixes landscape and still life by creating something really new and outstanding. 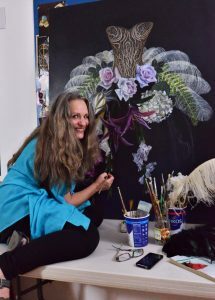 She’s able to paint amazing and very detailed wild landscapes as the only subject, using them, sometimes, as backgrounds to wonderful compositions made with period clothed and colored flowers. 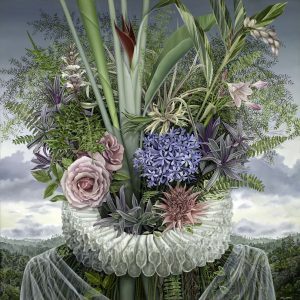 She creates a surreal world in which nature and textures are perfectly matched and complement each other. Watching at her paintings you immediately see the uniqueness of them, you are impressed by the moltitude of details both in the background landscape and in the main subject when you surprisingly find a clothe entity at the center of the scene. The amazing thing is the perfect equilibrium in the visionary scenario she paints, where any subject is esalted by the other elements without any conflict, though the contrast of overlapped different subjects. 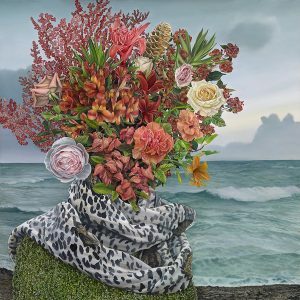 Her work is represented by Carl Hammer Gallery in Chicago.